Denver Teachers Strike over Bonus-Based Pay System, Demanding Reliable Salary Plan & Better Wages | Democracy Now! JUAN GONZÁLEZ: We begin today’s show in Denver, Colorado, where public school teachers are preparing to strike for the second day, after negotiations between the teachers’ union and the school district failed to reach a contract over the weekend. The Denver Classroom Teachers Association is demanding an increase in teachers’ base salaries rather than putting money in incentives and bonuses, as the district wants to do. Teachers held a rally Monday outside the Colorado state Capitol after spending the morning on picket lines. This is Amie Baca-Oehlert, president of the Colorado Education Association. AMIE BACA-OEHLERT: Our students are the ones who suffer the most, when qualified, committed and caring educators can’t afford to stay in the classroom. Teachers want to stay. There’s no place we’d rather be than in front of our students every single day. But we don’t need a bonus to stay. No, we need reasonable class sizes. We need mental health supports for our students. … So bring us a proposal tomorrow that has a fair, transparent and competitive salary schedule that prioritizes base salary over bonuses that disrupt our students’ education. Accept the DCTA proposal. JUAN GONZÁLEZ: Denver teachers walked out Monday following 15 months of negotiations over a controversial bonus-based pay system that educators say leaves them unable to predict their salaries and guarantee financial security. The district’s contract with the professional compensation system for teachers known as ProComp expired last month, and teachers are now pushing the district for more reliable wages. The starting salary for a Denver teacher for the 2019-2020 school year is $43,255, according to The Denver Post. AMY GOODMAN: Several Denver students joined their teachers on picket lines outside their schools Monday. Many complained of chaos inside the schools due to inadequate staffing of substitute teachers and lack of schedules for students. This is Denver’s first teachers’ strike in a quarter of a century. It comes just weeks after a historic 6-day teachers’ strike in Los Angeles ended with victory for educators demanding smaller class sizes and higher wages. These actions are the latest in a wave of teachers’ strikes that began last year in Republican-controlled states like West Virginia, Oklahoma and Arizona. Well, for more, we go to Henry Román, a Denver elementary school teacher, president of the Denver Classroom Teachers Association. Welcome to Democracy Now! from Denver Open Media. Henry Román, explain what you’re demanding. HENRY ROMÁN: Sure. The current system in Denver is—of pay, is ProComp. And ProComp is largely based on one-time incentives that are mostly determined by factors outside of the teacher’s control. This means educators in Denver have to largely depend on variable pay, variable pay that decreases over time. For example, we used to have these one-time incentives based on test scores, like top-performing, high-growth schools, that were at one point $5,000; now they’re only $1,000. And obviously it’s very hard for our educators to financially plan for the future when they have to see that kind of variable pay. And that’s one of the main reasons why many educators in Denver are leaving. You know, the normal attrition rate for most schools or most school districts is about 10 percent. But the teacher turnover rate here in Denver is anywhere from 20 percent to 25 percent. And every single year, we hire about 1,000 new educators. And that’s definitely a challenge. JUAN GONZÁLEZ: Well, I wanted to ask you, in terms of the compensation system that exists now—some of it, according to the district, is meant to definitely not only improve the quality of education, but also especially those schools that are most in need. There was an incentive for teachers to—extra money to teach in the most difficult schools or the lowest-performing schools. Do you want to get rid of the entire compensation package or just redesign it? HENRY ROMÁN: A major redesign, for sure, but those bonuses have proven to be ineffective. And it’s our students that are paying the price for these experiments that really do not work. It’s a big issue in Denver. We have a significant teacher turnover crisis due to the way we are compensated in Denver. AMY GOODMAN: Let’s go to a striking teacher at Denver’s East High School. So, this is my third year in DPS, my fifth year as a teacher. Right now, I can’t afford to have a family. My husband and I would really like to start planning for that in the next few years. And as it is now, our baby would have to probably sleep in a closet or something, because we can’t afford to upsize our home or anything like that, to do any renovations. And so, we’re kind of in a holding pattern. And so we’re hoping that after these contract negotiations, that we’ll be in a place where we can save money and start a family. AMY GOODMAN: And let’s go to a Denver high school student who took part in yesterday’s teacher protest. With Denver rising up in the economy, it’s getting harder to live here just being a teacher. So, a lot of teachers—if you go to the teacher parking lot, a lot of the cars have Uber stickers. A lot of the teachers are not being able to live in the city that they work with, just with the money that they’re getting from here. And that’s really unfair. So, I mean, like, people are already fed up, so everyone’s—everyone’s not OK with the situation now. AMY GOODMAN: Some of the voices on the picket line yesterday. Henry Román, we’re talking about Colorado, which is a blue state in terms of the governor. Jared Polis, the new governor, is a Democrat. He said he wasn’t going to intervene. The mayor of Denver is a Democrat. What difference does that make? It’s similar to what happened in California. We were just in Los Angeles during that strike. And the mayor of Los Angeles was actually the one who was leading the discussions and the negotiations. HENRY ROMÁN: Yeah, in this case, the governor has taken a more active role. And he basically, earlier, said that he respected our right to strike. And he decided actually not to intervene, which is more or less a green light for us to strike. So, we welcome his efforts to get both parties together. As a matter of fact, I had a conversation with him last night about where we are. We are scheduled to begin negotiations this morning at 10 a.m. at the Denver Public School Library. It’s an open meeting for the public, for the press, for everyone. I mean, all of our meetings are live-streamed. We have our members, the public, the press, everyone, because we have absolutely nothing to hide as we’re having these conversations. I mean, what has been really problematic is the district has spent about $4 million on bonuses for administrators that are already well paid. And that has been, you know, a big issue for us when we are struggling on so many other areas in Denver, in Denver public schools. JUAN GONZÁLEZ: And, Henry Román, this whole issue of the bonus system, the impact it has on teachers being able to plan their economic future, could you talk about that, as well? HENRY ROMÁN: Yes, yes. I mean, it’s, on one end, the variable pay and the fact that it’s not a reliable compensation. What our teachers are demanding is a predictable income. And ProComp also has like 10 moving parts, so you have, you know, market incentives—hard to serve, hard to fill—student growth, top-performing, high-growth, professional development. You know, it’s a bunch of things. And it’s so complicated that when they get paid, they actually have no idea how much they’re actually making. And even payroll has a hard time explaining how teachers are paid. So what we want to do is simplify the system, so it’s easy to understand how people are getting paid and how much they’re getting paid. We also would like to have, obviously, a higher base pay, so our teachers and educators can live where they work, and, obviously, increase the base pay, so we can recruit and, more importantly, retain our experienced educators in Denver Public Schools. AMY GOODMAN: Is it possible the strike will end today? HENRY ROMÁN: It’s hard to predict. It’s highly dependent on the proposals that the district will bring to the table today. We ended last Saturday with our counterproposal, and then it is their turn to come to the table with a counter, too. So, we’ll see where that goes, and we’re willing to sit down and negotiate for as long as needed. AMY GOODMAN: Henry Román, we want to thank you for being with us, elementary school teacher, president of the Denver Classroom Teachers Association. The Denver teachers’ strike is the first in a quarter of a century. Of course, we’ll continue to follow it. This is Democracy Now!, democracynow.org. 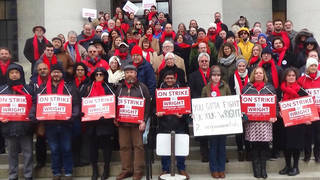 When we come back, we go to Dayton, Ohio, to, well, a strike that was one of the longest at a public college in U.S. history. It just ended. Stay with us.